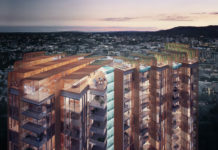 Majella Property Developments have submitted an application to transform the site of the Broadway Hotel in Woolloongabba into a new mixed use residential development which will be known as Broadway. Located at 44 Balaclava Street, Woolloongabba, the project consists of a 27 storey tower, three levels of retail and commercial space as well as a full restoration of the historic Broadway Hotel. The Broadway Hotel was built in 1880 for Brisbane publican Michael McKenna. Its decorative facade was designed by prominent Brisbane architectural firm John Hall and Son. According to the development application, the Broadway Hotel is said to have reflected the optimism of the time when it was built and was an example of late Victorian architecture in Brisbane, influenced by the eclecticism of the “Queen Anne” movement, popularised by English architect, Richard Norman Shaw in the 1880s. “When opened in 1890, the attendant advertising in The Southern World of 22 October emphasised the proximity of the new hotel to the Woolloongabba five-ways, and that country visitors would be well catered for with superior accommodation” – Queensland Government State heritage Register. It was designed in the tradition of substantial English corner pubs, gaining patronage by attracting the attention of passing trade, using elaborate architectural forms and detailing as advertisement for the business. The building is asymmetrically arranged, with a principal corner entrance, emphasised by an octagonal tower surmounted by a spire projecting above the roof line of the building. Designed by Hayes Anderson Lynch Architects, the tower form draws inspiration from its surroundings to create spaces and design elements that reflect the Broadway Hotel’s distinctive Victorian era turrets. “These turrets are incorporated on all facades, breaking its horizontal appearance into that which comfortably sits alongside the historic hotel.” – Hayes Anderson Lynch Architects. Originally designed as a luxurious and opulent hotel for wealthy out-of-town visitors, Broadway Hotel has since transitioned into a standard ‘local pub’, much loved and celebrated within the Brisbane entertainment scene. However in 2010, a fire broke out in the hotel causing the building to be abandoned for over seven years. The existing heritage building is to be retained, with demolition and partial demolition proposed, to accommodate commercial, restaurant, or similar purposes at the ground and podium levels. “Complementing the intricacies of the historic hotel, the proposed development integrates a finer level of detail along this ground plane. Rather than mimicking these details, the design utilises the proportions of its surroundings and creates a modern and stylistic interpretation of its historic counterpart”. – Hayes Anderson Lynch Architects. The development proposes a Queensland-first operable window system known as Bloomframe windows which transform into balconies providing the ability to boost natural ventilation and open up more than 50% of the building’s facade. 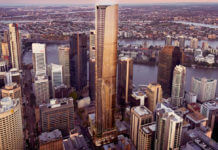 The building’s non-static facade will therefore appear to be ever-changing and suits Brisbane’s subtropical climate. A rooftop recreation deck is planned on level 27 which includes a lap pool, barbecue facilities, function rooms, steam room and outdoor entertaining areas. An outdoor recreation space is also planned for the level 4 podium. The proposal includes a futuristic ‘rack and stack’ automated car parking system for 388 car bays across five basement levels. The car stacking system allows residents and visitors to drive their cars into one of the four car lifts located on basement 1. The automated lift then lowers the car down to one of the four storage levels and places the car into a vacant spot in the rack. Generally considered a more environmentally friendly design solution than a traditional basement design. Frank Monsour, Majella Group founder said the company is pleased to be bringing innovations to the Broadway development including centralised recycling, cutting edge Bloomframe windows and the largest automated car parking system in Australia. The development aims to ‘return the site to the pedestrian realm’ and rejuvenate the Broadway Hotel by ‘reinstating the area’s iconic status’ and introduce a new mixed-use ground plane integrated with laneways. 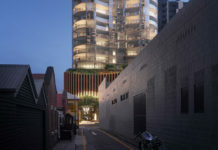 The design will see a new commercial hub, connecting with and expanding the already growing economic centre of Woolloongabba. The DA number for this development is A004604175. Reminiscent of the 1980s PPG Building in Pittsburgh by Philip Johnson. In my view the newly-completed Sunland Abian in Alice Street takes that prize. I suspect the proposed 443 Queen will be a stunning landmark as well. Cheers. Wow. Way to spit in the face of subtropical design which we should be pushing over this brain fart of an idea – especially with apartments being a glass box with east & west aspects. Also their pool isn’t even close to being DDA compliant – how you miss that in a DA submissions smacks of very little rigor applied to the design. Must be one of those ‘we will sort it out later’ developments. This beautiful old hotel just mysteriously burned to the ground a few months after the DA for that monstrosity was knocked back. Disgraceful!!! !